The Sheep Whisperer: Hams Gone Wild! 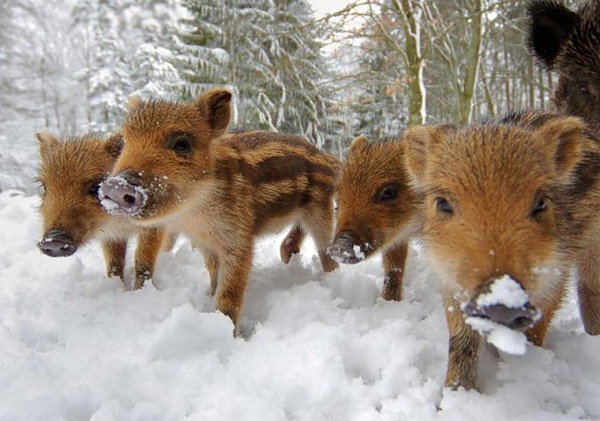 Wild pigs are known by a number of names. 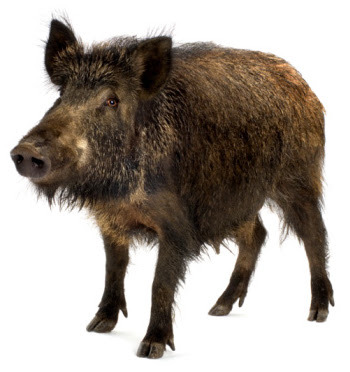 Wild boars, wild hogs, Eurasian Boars, & Razorbacks are all names for the "Wild" relative of the pig. 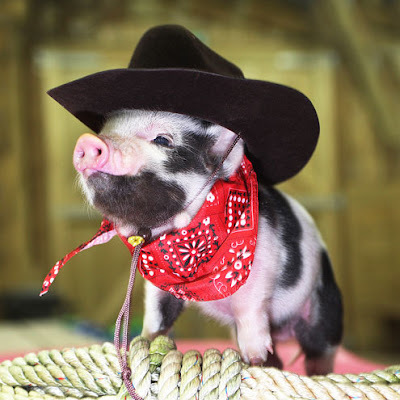 Columbus, DeSoto, & Ponce De Leon were the first Spanish explorers to introduce domestic pigs to the Americas in the 1500's. Columbus "let them loose" to supply food for a later visit. I won't "Boar" Ewe with the details, but I was "Born to be Wild"! Male wild boars live solitary lives for most of the year. The only exception occurs in breeding season, when the males gather together to compete & fight for a chance to mate with a female. Male boars have large tusks that curve upward on their bottom lip, as well as unusual hollow tusks on their top lip.The top tusks actually serve as "sharpeners" for the bottom tusks! When Ewe Smile, the Whole World Smiles with Ewe! 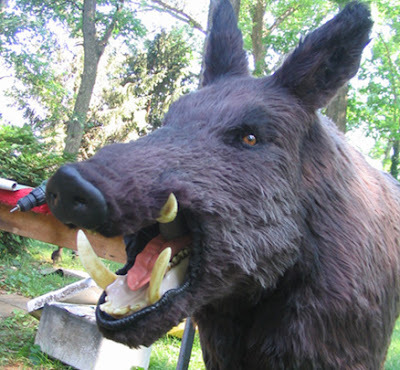 Female wild boars are rather gregarious, & live in sounders, which are groups of 6-30 animals. 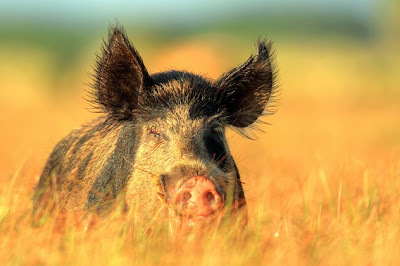 Sounders usually contain 3 breeding sows & their young, They are located in close proximity to other sounders. Females have smaller tusks than males on their lower lips & very sharp canines. Females are very protective of their young & will charge & bite if threatened! Don't Ewe come any closer! I promise I'll take a bite out of Ewe-r day! I hope Mother Superior lets us camp here! Ewe know how Matriarchs are! 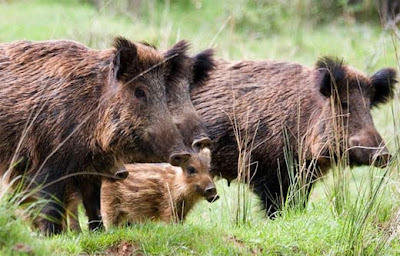 Wild boars are nocturnal, only foraging at night for food.They have tiny eyes & poor eyesight.They rely on their superior sense of smell & their distinctive snout, which acts as a bulldozer in unearthing its food. 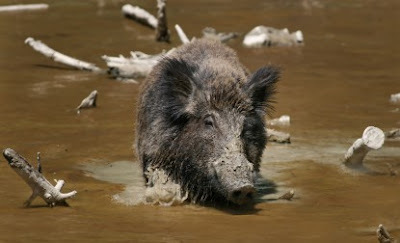 Wild boars are omnivorous scavengers, eating grass, nuts, tubers, berries, carrion, refuse, insects, & small reptiles. Did Ewe know that my weight averages from 110-220 lbs.! I normally sleep 12 hrs. during the day! I prefer hunting at night! Females are pregnant for just under 4 months. Routinely, 1-3 days before giving birth, they excuse themselves from the group to farrow. Farrowing is building a mound-like nest made of dirt & vegetation to give birth in. After 2-3 hours, she births a litter of 4-6 chocolate & cream striped piglets! They will rejoin the sounder in 4-6 days, after bonding & nursing with their wildly protective Mom! Sheep & wild boars have some things in common. Each family has a fiercely protective mom, & a "clueless" father, when it comes to taking responsibility for the litter! Female sheep & wild hogs also are very social, preferring being in groups with their families for safety purposes! 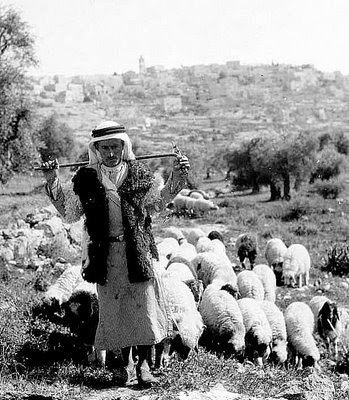 Sheep do differ from hogs in having a Shepherd to battle for them when danger threatens! Stick close to me & I'll take "Good"care of Ewe! Today, as the "Christmas spirit" is growing within Ewe, think of how blessed Ewe are to have Someone like the Good Shepherd watching over & protecting Ewe!